Make sure your home is holiday ready for hosting get-togethers and family events. 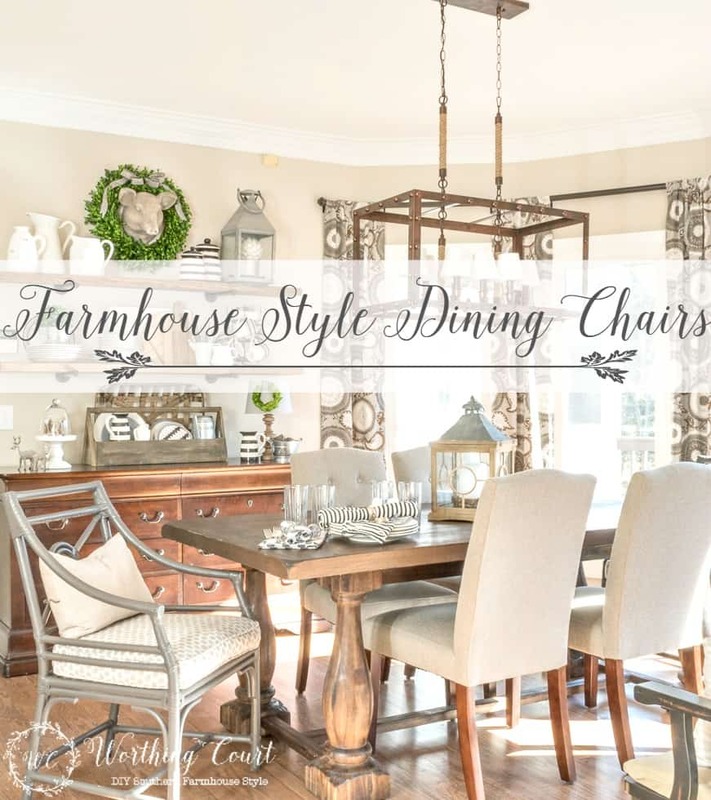 Here’s a great roundup of 12 affordable farmhouse style chairs to spiff up your dining area. Tis the season – well, almost! Thanksgiving and Christmas are probably the most popular times of the year for entertaining and opening our homes to guests. With that in mind, it seems that most everyone is ready to finish up those decorating projects, replace or add furniture and just generally spiff up our homes. We just flat out want our home to shine during the holiday season! Am I right? Everyone wants to put their best foot forward when welcoming friends and family into our homes. You’ll likely be spending a lot time around your dining or kitchen table enjoying good food and good conversation, so now’s the time to make sure that you have comfortable seating for all of your guests. 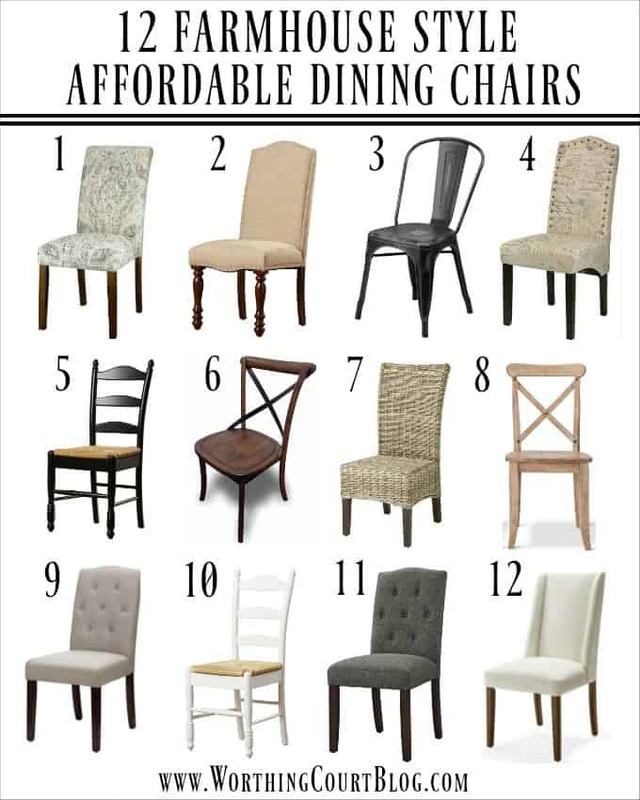 I’ve done the shopping for you and have put together a list of twelve farmhouse style dining chairs – most that cost under $100 each (some of them are sold in pairs)! We all know that the kitchen is usually the gathering place for company, so I made sure that the chairs I added to my kitchen table were comfy. We’ve spent hours around our table eating, laughing and playing games. That wouldn’t have happened were it not for the comfy chairs around my table. They’re #9 on the list and I’d buy them all over again, if I needed to! Where do your friends and family gather when you’re entertaining? Is it in your kitchen or some other spot in your home? I currently have all wood but would love fabric chairs. My only concern is I have cats and know they may end up napping on them and I am so OVER cat hair on things… Wondering what I could put down on them (when there not in use) that would keep the cat hair from sticking? Hi Loyda. My daughter has two indoor cats and uses Saran Wrap or something similar to both keep the cat hair off and to discourage them from sharpening their claws on her furniture. Nice collection of chair options and I always love seeing your beautiful kitchen! Enjoy your weekend! LOVE your table! Trying to finish up my dining room projects before company arrives for Thanksgiving! What is glitter tape that was shown on decorating Christmas tree tutorial? Where can you buy it other than there. I don’t live in that state. Hi Bev. I found it two different places online. This one is encrusted with tiny beads instead of glitter: https://www.trendytree.com/search?query=curly+garland . This one is covered in glitter, like mine: http://www.christmascentral.com/casearch.aspx?SearchTerm=bubble+christmas+ribbon . All my guests always end up in the kitchen with me. I don’t know if it’s because I am there, or because that’s where the food is! Everyone ends up in the kitchen of course! Good thing I have comfy chairs in there…all different. I love that mix and match look. I love No. 7 and No. 11. It’s nice to know you chose No. 9, since it’s also BHG and you’re so happy with them. They look lovely in your dining room. I am needing new kitchen chairs, so thanks for the ideas! I’m leaning toward #5 or 6! Love chair #6- I would like to try upholstered chairs, but I have kids and I can see disaster with that! Thanks for the ideas! This is super helpful, bc we’re in need of chairs also! Love your style! It’s inspiring ! Thank you! I needed two more chairs before Thanksgiving on a hundred dollar budget. Found some! Love #12 but my husband is a slob and off-white would not last long with him. I do like the ones you have in your breakfast area though! Great price too! So many good options to choose from! We have #6 from wayfair. This post was meant for me! I am trying to decide if I want to paint the chairs around my kitchen table or get new ones. Great options! I think your dining area is stunning it photographs beautifully. great selection of chairs always nice to have a few extra. Please enter me into the drawing. I really love the black ladder black dining chair. I remember seeing those when I was little and it brings a feeling of nostalgia to me. I used to think that modern chairs are included on contemporary furniture sets. I was wrong. 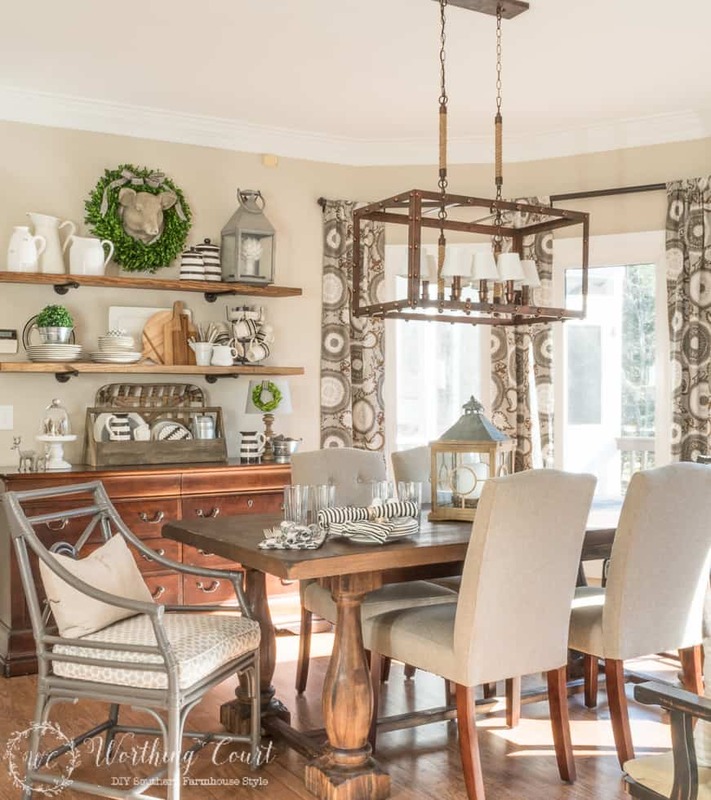 Looking at your ideas bout the farmhouse dining chairs is giving me a great idea in providing such chairs in my dining room, which still represents the modern theme. I love the Kubu dining chair. It is exotic, while adding the country-style within the dining room.